Core stability is the key to unlocking an athlete’s optimal performance potential. Without it, forces cannot be efficiently transferred from the lower body to the upper extremities. The Dead Bug exercise is commonly thought of as a remedial core exercise best used in wimpy rehab programs. In reality, the Dead Bug can be one of the most effective movements you can perform to dramatically improve your sports performance. The Dead Bug is a great way to work in a developmental position (supine) where we have a great deal of ground contact with our backs. This gives the body more proprioception – or feedback – on the position that we are in. The Dead Bug allows for us to work in a fundamental position to resist lumbar extension. This basic pattern can be progressed to levels designed for improved performance in even the most elite athletes. The goal of a Dead Bug is to activate our superficial and deep core musculature while our extremities are in motion. If an athlete wants to perform to the best of their ability, they will need a solid foundation. Athletes require the ability to execute a variety of different movements (catching a pass, stealing second base, grabbing a rebound, playing defense, etc.). All of those movements require the core to stabilize the spine. If the body does not have the strength to support the spine and transmit force, it is hard to expect the core to be reflexive and have control in a dynamic environment. The Dead Bug creates a situation where this foundation can be built and developed to augment overall athletic performance. There needs to be a full stomach-to-chest nasal inhale followed by a forceful mouth exhale. Air is not just filling the stomach on the inhale, but also your sides and low back in the ground (creating a 360 degree expansion). During that initial exhale, the ribs should be pushed down and your anterior core and glutes should be activated (like you are about to get punched in the gut). Once you fully exhale, the ONLY way to stabilize the spine is with your core musculature. Those ribs are now locked in as well as that low back is pinned into the ground. The extremities can be brought down during the inhale and brought up during the subsequent exhale. For a greater challenge, exhale the entire time the extremities are going away from the body. The movement needs to be SLOW. If you are not feeling any fatigue, you are doing something wrong. Watch the lumbar spine for any extension movement or gapping between the back and ground. It should appear that the trunk is maintaining complete rigidity throughout the movement. The only motion that should be happening is from the extremities. Progression to a more difficult version should be prescribed once the ability to do 2-3 sets of 8-12 reps each side is achieved with manageable fatigue. (Certainly, there are exceptions to every rule, but this is what has worked for my clients and I). 1) Dead Bug Heel Taps: This is the first progression of the dead bug performed with just the legs being in motion. The knees will remain bent and one heel at a time is brought to the ground. The arms are static and held straight above for the entirety of the movement. 2) Dead Bug Full Taps: Building on the first movement, the full taps will incorporate the movement of the arms. The opposite arm and leg will now move together. The knees still remain bent, but the upper extremities are now involved. 3) Dead Bugs: This is your standard Dead Bug. We are now fully extending the knees along with the arms. Work on holding a one-second pause while the arm and leg are fully extended. 1) Anti-Extension Dead Bug : The movement is now receiving external resistance from a band directly above the head. Ensure that you push up and forward into the band. There should be enough resistance that you are having to put up a good fight to not allow the band to go back. You can perform this with the knees bent or with fully extending the knee. 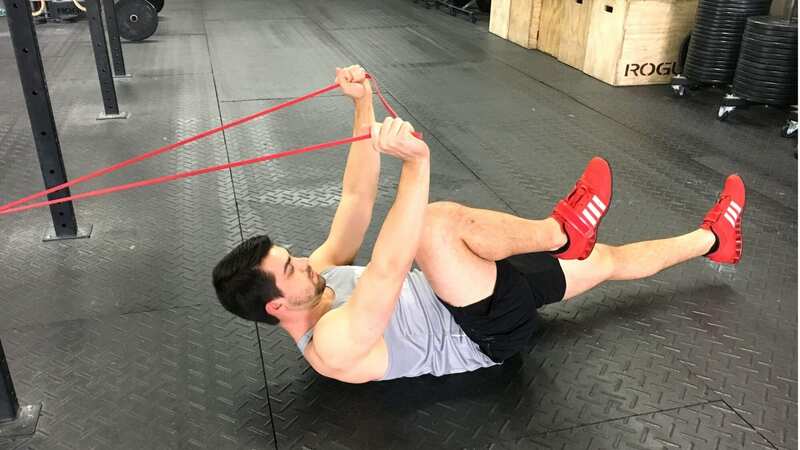 2) Anti-Rotation Dead Bug : This is an excellent way to work on rotational core stability. The band should be at chest level and high enough that the arms can fully extend. The same principles apply as the Anti-Extension Dead Bug. There should be enough resistance that you have to really stabilize in order to the hold the band above your chest. 3) KB Bench Dead Bug: Lay down on a bench and hold a kettlebell steady above your chest. Keeping the knees bent, bring one leg down until you feel your upper thigh getting close or hitting the bench, then return. FYI: This is way harder than it looks. JACKSON TAYLOR HAS BEEN A STRENGTH AND CONDITIONING COACH FOR THE PAST 6 YEARS AND CURRENTLY RESIDES IN SAINT AUGUSTINE, FL. HE HOLDS A BACHELORS OF SCIENCE IN BIOLOGY AND NEUROSCIENCE FROM WESLEYAN UNIVERSITY, AND IS CURRENTLY A DOCTORAL STUDENT OF PHYSICAL THERAPY AT THE UNIVERSITY OF ST. AUGUSTINE FOR HEALTH SCIENCES. HE IS A USAW SPORTS PERFORMANCE COACH, ACE CERTIFIED PERSONAL TRAINER, AND A STUDENT MEMBER OF CLINICAL ATHLETE. HIS CLIENTELE HAS RANGED FROM ELITE COLLEGE ATHLETES TO SPECIAL NEEDS PEDIATRIC POPULATIONS. HIS TRAINING IS DEFINED BY MOVEMENT PROGRESSION. HUMANS ARE MEANT TO MOVE IN A VARIETY OF PATTERNS WITHOUT ISSUE. THE GOAL WITH ALL OF OF HIS CLIENTS IS TO EMPOWER THEM THROUGH BUILDING A STABLE PLATFORM, CORRECTING MOVEMENT IMBALANCE, AND DEVELOPING PHYSICAL AND MENTAL STRENGTH.